The video released Friday may be the first instance of a U.S.-designated terrorist group using Trump's call or other current issues in the U.S. to attract followers online. Presidential candidate Hillary Clinton said last month that the Islamic State militant group was "showing videos of Donald Trump insulting Islam and Muslims in order to recruit more radical jihadists." The new video also shows instances of American police beating or shooting black males. The police footage, some of it originally captured on police cameras, has prompted a fierce debate in the United States over appropriate limits on the use of violence by police. The violence has given rise to the "Black Lives Matter" movement, which has organized protests in several cities. In an interview Friday with VOA's Somali service, Jibril Afyare, president of the Somali-American Citizens League in Minneapolis, characterized the video as a "desperate move" by al-Shabab. "They are trying to link [to] what's going on the U.S., whether it's Islamophobia, whether it be killing of African-Americans, whether it be young men in Minnesota," he said. "They're trying to link and have a buy-in from the community and therefore get more recruitments for their ideology." Afyare said his organization is already conducting grass-roots education efforts aimed at dissuading Somali-Americans from supporting al-Shabab, but may need to produce videos or launch social media campaigns to counter the militant group's message. FILE - A February 2011 photo shows al-Shabab fighters on parade with their guns during military exercises on the outskirts of Mogadishu,Somalia. 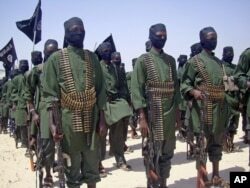 Al-Shabab once controlled most of southern and central Somalia but has been pushed out of the country's main cities and towns by African Union troops and the Somali government. VOA's Harun Maruf contributed to this report.